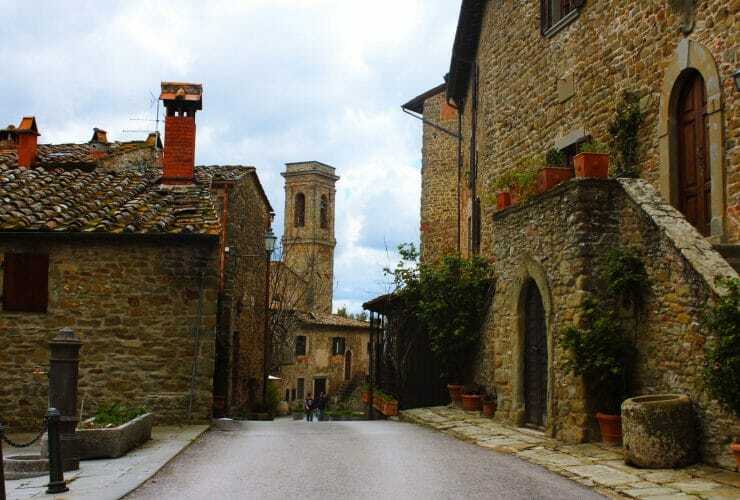 I am walking on a typical “white road” surrounded by light forests and occasional clearings that offer phenomenal views over the rolling hills of the Chianti landscape. It is the middle of April and, in the heart of Tuscany, spring is announcing its arrival everywhere. Little buds of green adorn the trees while the birds are chirping of new beginnings. On the side of the road and in the valley, wild yellow flowers mix with the fields of daisies that have been blossoming all around. A few clouds gracefully move across the sky as the hilltop hamlet of Volpaia comes into sight. First documented in 1172, this fortified village still produces and distributes wine to this day. The streets are narrow and the houses are built of stones. Remains of plaster show on some of the walls while vines are climbing some others. Meanwhile, the cracks in between two houses offer endless views into the valley. On another hill in the distance, I make out the silhouette of Radda in Chianti — one of the three original “Chianti Classico” towns. There is a fairly open secret in Italy: if you want to get a feeling of a place and its people, you find the nearest bar or café and order a drink. As it’s now 12:30pm, I am a little late for cappuccino according to the Italian coffee culture, but I don’t mind: I need caffeine…but something more than just an espresso that’s downed in a quick sip. On the terrace outside sit an English couple and a group of Italian friends. The blond-haired woman at the bar, Paola, knows and remembers them all. “Hello, tesoro! Ciao, cari! Amore, it’s nice to see you’re back!” Paola has a distinctive voice and uses sweet names for everyone. With a first taste of Volpaia I venture off again — down the road and through another forest at the foot of the hill. As I stumble into the next opening I spot a church — “Pieve di Santa Maria Novella,” one of the many churches and chapels found in the hills surrounding Volpaia. Except for a couple of fellow hikers, there’s not a single soul in sight. Dark clouds begin looming on the horizon, adding a spectacular contrast to the scattered stone houses, the rolling vineyards, and the centuries-old church. I keep walking through its garden that’s framed by olive trees and sprinkled with daisies. It is aperitivo time when I return to Volpaia, and the bright orange Spritz that Paola puts down in front of me almost makes up for the sunset we don’t get to see tonight. More and more people arrive, and the tables around me are filling up quickly. “It’s alright, I’m about to get going,” I mouth at Paola from across the bar as another couple enters. Stunned and a little surprised, I do just that. Whether I come back in a week, a month, maybe even a year — like Paola did with the other guests, I have a feeling she’ll remember me, too. Would you like to experience Volpaia through your own eyes? 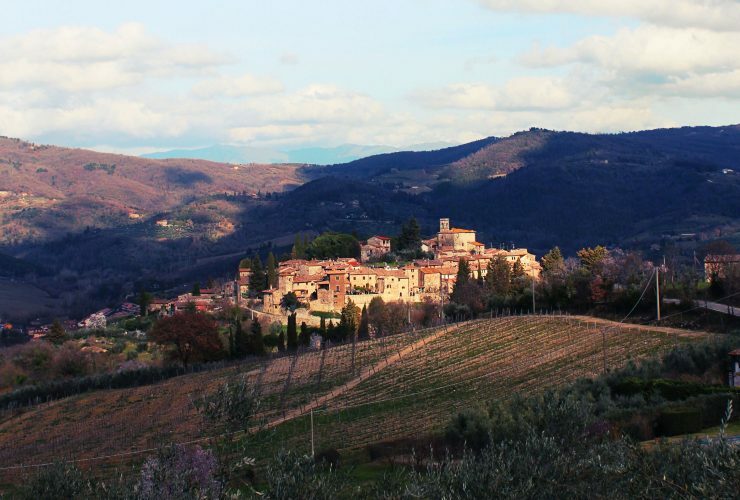 Our guided walking tours “Tuscany’s Hilltowns” and “Tuscany’s Chianti” will lead you there.